This article is about the mountain in Tennessee. For the mountain in California, see Mount Le Conte (California). For other uses, see Mount Le Conte. Mount Le Conte (or LeConte) is a mountain in Sevier County, Tennessee located in the Great Smoky Mountains National Park. At 6,593 ft (2,010 m) it is the third highest peak in the national park, behind Clingmans Dome (6,643 ft, 2,024 m) and Mount Guyot (6,621 ft, 2,018 m). It is also the highest peak that is completely within Tennessee. However, from its immediate base to its summit, Mount Le Conte is one of the highest peaks in the Appalachian Mountains rising 5,301 ft (1,616 m) from its base, near Gatlinburg, Tennessee (1,292 ft/394 m). There are four subpeaks above 6,000 ft on the mountain (referred to as the LeConte massif): West Point (6,344 ft/1,934 m), High Top (6,593 ft/2,010 m), Cliff Tops (6,555 ft/1,998 m), and Myrtle Point (6,200 ft/1,890 m). In addition, Balsam Point (5,840+ ft/1,780+ m) serves as the dramatic west end of the massif. Additionally, the mountain is notable for having the highest inn providing lodging for visitors in the Eastern United States. There is considerable controversy over just which member of the Le Conte family the mountain was named for. The United States Geological Survey lists Joseph Le Conte, famous geologist, as the man for whom the mountain was named, supposedly by Swiss explorer Arnold Guyot. However, in recent years this claim has been challenged by local authorities (including the authors of A Natural History of Mount Le Conte), who in turn believe that the mountain derives its name from Joseph's older — and less famous — brother John Le Conte, a physicist at South Carolina College. 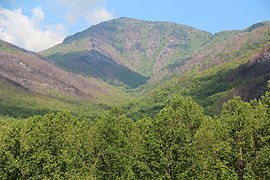 Their story alleges that the mountain was named by Samuel Buckley in respect to John's help in moving his barometer to Waynesville, North Carolina, at Buckley's request. Although the mountain was measured in the 1850s, very little activity took place on the mountain until the 1920s, when Paul Adams moved to Knoxville, Tennessee. An enthusiastic hiker and explorer, Adams spent much of his free time creating adventures in the mountains. In 1924 he joined the Great Smoky Mountain Conservation Association, a group dedicated to making the region into a national park. As part of this push, later that year he led an expedition up the mountain with dignitaries from Washington, in order to show the group what rugged beauty those mountains held. The group spent the night in a large tent which would later become a cabin, and eventually the LeConte Lodge, a popular resort near the top of the peak. The trip was a great success and about a decade later Mount Le Conte, and the surrounding region, was protected as part of the Great Smoky Mountains National Park. Mount Le Conte lies in the Appalachian Blue Ridge geologic and physiographic province. It is made up of Late Proterozoic rocks; mostly metamorphosed sandstone, siltstone, shale, and conglomerate formed over 800–450 million years ago. Millions of years of weathering has caused significant erosion, giving the mountains in the region, including Le Conte, a distinctive, gentle sloping feature. A dense stand of Southern Appalachian spruce-fir forest, a remnant of the last Ice Age, coats the mountain's peaks and upper slopes. Mount Le Conte is notable for having the highest inn providing lodging for visitors in the Eastern United States. The LeConte Lodge is a small resort, established in 1925, located on the top of the mountain. First, it was a tent, then a single cabin, and now it is a series of small personal log cabins and a central lodge/dining hall situated along the top of a mountain. It can accommodate about 50 guests a night, and is generally open from March–November. There is no transportation to the lodge and all guests must hike in on one of the five trails that access the mountain. Due to this lack of access, supplies must be brought in via helicopter and llama pack trains. The climate at the lodge is similar to that found in southern Canada, with cool summers and cold, snowy winters. Currently, the lodge is maintained under a lease with the National Park Service. The Boulevard Trail — 5.4 mi (8.7 km) (8.0 mi or 12.9 km from Newfound Gap); Begins on the crest of the Great Smoky Mountains 2.7 mi (4.3 km) east of Newfound Gap on the Appalachian Trail; it never dips below 5,500 feet (1,700 m). Trillium Gap Trail — 8.9 mi (14.3 km); The trail passes behind Grotto Falls, the only opportunity to walk behind a waterfall in the park; Trillium Gap offers spring wildflowers and a short spur hike to Brushy Mountain; the only horse trail on the mountain; the llama trains that supply the lodge use this trail. Starting the Trillium Gap Trail at the Trillium Gap parking lot shortens the climb by 2.4 mi (3.9 km), making this a 6.5 mi (10.5 km) trail. The combined traffic of these five trails makes Mount Le Conte one of the most heavily traversed mountains in the park. The Alum Cave and Rainbow Falls trails in particular tend to become overcrowded with visitors seeking rewarding payoffs just a few miles into the trails. Hikers can stay in an Appalachian Trail style shelter overnight for $4, limited to 12 spots, with a backcountry permit and reservations from the National Park Service. The area was affected by the 2016 Southeastern United States wildfires. The park, including the area around Mt. Le Conte, was evacuated during the disaster. ^ "Mount Le Conte". Geographic Names Information System. United States Geological Survey. ^ "LeConte Family". New Georgia Encyclopedia. Retrieved 20 July 2018. ^ "MT LECONTE, Tennessee, USA:". Climate-Charts.com. Retrieved August 4, 2008. ^ Morgan Simmons, "Mount Le Conte Llama Packer Reaches End of the Trail," Knoxville News Sentinel, 14 November 2011. Retrieved: 14 November 2011. Wise, Kenneth; Ronald H. Petersen (1998). A Natural History of Mount Le Conte. Knoxville, Tennessee: University of Tennessee Press. ISBN 1-57233-010-4. Wikimedia Commons has media related to Mount Le Conte.